Enfield Council has launched the Sugar Smart Enfield initiative with the Great Sugar Debate. The campaign aims to encourage local organisations to promote healthier, lower sugar alternatives and help make the borough healthier. Join the Great Sugar Debate and have your say. You could win one of 3 prizes! The Sugar Smart Enfield initiative was launched on Saturday 13 January along with The Great Sugar Debate at Enfield Town FC’s home match against Merstham FC at the Queen Elizabeth II stadium. The initiative is part of Enfield Council’s Healthy Enfield campaign and aims to encourage local organisations to promote healthier, lower sugar alternatives and help make the borough healthier. 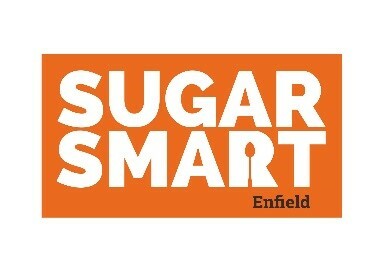 Sugar Smart Enfield will be launched by Cllr Christine Hamilton, Mayor of Enfield, and Cllr Krystle Fonyonga, Cabinet Member for Community Safety & Public Health. The initiative is part of the national Sugar Smart UK campaign led by chef Jamie Oliver and charity Sustain, which aims to educate and help people to reduce their excessive intake of sugar. Cllr Fonyonga said: “Overconsumption of foods and drinks high in sugar is a major contributor to the health crisis, especially childhood obesity. Almost one in four children in Enfield starts primary school overweight or obese and by the time they reach secondary school it’s more than two in five. It is therefore essential that we act now and support people to reduce their sugar intake and lead healthier lives. “We want Enfield to become Sugar Smart by helping people in the borough to reduce their sugar intake. It’s vital that local businesses, organisations, schools and residents get involved. We know there is no one solution to obesity and poor diet and only a multi-pronged approach involving everyone will lead to long term change. I encourage you to join the Sugar Smart movement now. A number of organisations have already pledged to improve their catering and vending arrangements, install a water fountain and provide education to children. Middlesex FA will be encouraging FA Charter Standard Clubs to implement a Water Only Policy, while coaches and managers from Enfield Town FC will be educating their youth teams about the danger of eating too much sugar. Enfield Council is also supporting staff and residents to reduce their sugar consumption by limiting high sugar content drinks and snacks from sale at the Dugdale Centre. Locally sourced and sustainable food has been introduced into the menu at The Dugdale Centre which is proving popular with the public. These measures will be extended to the Civic Centre this year. Act now to reduce sugary drinks and foods and join the Sugar Smart movement in Enfield. Join the Great Sugar Debate and have your say!